Emily has been practicing martial arts for 12 years. She has earned silver medals two years in a row for a submission challenge, and a national USACW championship in 2017 and 2018. I am a part of the Katamedo Jiu Jitsu school in Fenton, Missouri, ranking a brown belt in Judo and Jiu Jitsu. Micahel Caldwell is a 2x FICW World Combat Wrestling Champion, having won his division in Japan at the 2017, and St. Louis at the 2018 World Championships. Michael is two-time Collegiate All American (4th Twice) at Lindenwood University, three-time High School Folkstyle State Qualifier and multiple-time State Placer in Greco Roman and Freestyle Wrestling. He currently studies Brazillian JiuJitsu. Daniel is a 2018 USACW National Champion and 2018 FICW World Champion. He began wrestling at 14. After a High-school career in Mendota, Illinois, his family moved south to LaSalle where he began training in boxing and mixed martial arts. At the age of 20 Daniel began competing professionally in mma, with over 20 fights to his name. He began training in Brazilian Jiu Jitsu under professor Mark Turner, Demian Maia’s first American black belt, from Naperville, Illinois. Since then Daniel has won over 10 expert division championships in different organization. In 2016 he won the USA Grappling National Championship, becoming a nogi USA Team member competing at the UWW World Championship in Minsk, Belarus earning a Bronze Medal at 71 kilograms. In 2017 Daniel competed in the IBJJF nogi World Championships at 162.5 pounds beating some of the worlds best brown belts, earning myself a nogi world championship. Devon is a 4 year high school wrestler with a no gi and gi BJJ background. 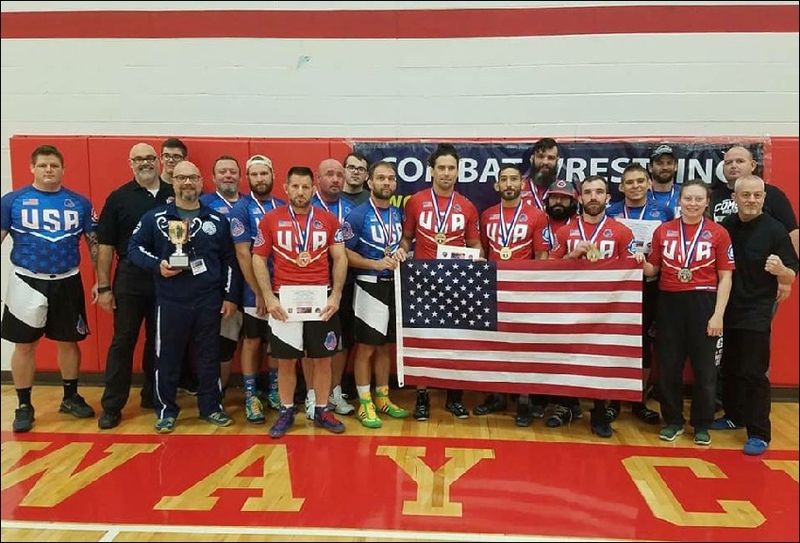 He earned a Bronze medal at the 2018 USACW Nationals, his first time competing in Combat Wrestling. 2018 World Silver Medalist. Brett is a New Yorker by birth, hailing from West Palm Beach, now living in Des Moines, Iowa, Brett currently trains at Des Moines Judo Academy under Brett Parkhill and Porcelli’s Training Center under Anthony Porcelli. Brett began his training career with Wald Bloise (Jiu-Jitsu) and Avtandil Gogolishvilli (wrestling) at Team Nogueira in West Palm Beach, Florida. While there he was also coached by UFC/PRIDE veteran Marcus Aurelio and Eric Alequin. After 10 years grappling experience he has earned a Blue Belt in Jiu-Jitsu , Green belt in Judo , Multiple NAGA Expert division championships, and 1st place at the 2018 US Combat wrestling Nationals 74 kg. Travis started wrestling at an early age. He was an Oklahoma high school state placer and a decorated college wrestler, along with being a team captain of his college team for 3 years. After completing his bachelors degree in Business Administration he pursued a career in MMA where he began training in boxing and Brazilian JiuJitsu. During his MMA career he accumulated a 7-1 record in the amateur and professional divisions, where he also won a pro title in the feather weight division for Xtreme Fighting Inc. (XFI). Travis later won a national title in Beach wrestling at 70kg weight class in the veterans division and placed 4th in the senior division. He is currently working on his masters degree in education and is a high school wrestling coach in Oklahoma were he has coached numerous state placers. Travis took home a silver at the 2018 USACW Nationals. A high school and college wrestler, Myron is USACW 2018 National Champion. Myron defaulted at the 2018 world championships and did not compete. Michael placed 2nd at this year’s USACW Nationals. He was a Wisconsin State High School wrestling champion and followed that up in the Marines being a 2 time All-Marine Champion. Later, Michael became a Junior College All-American before wrestling for Division 1 Eastern Illinois University. In 2007 he made his first Nogi USA World Team for USA Grappling. 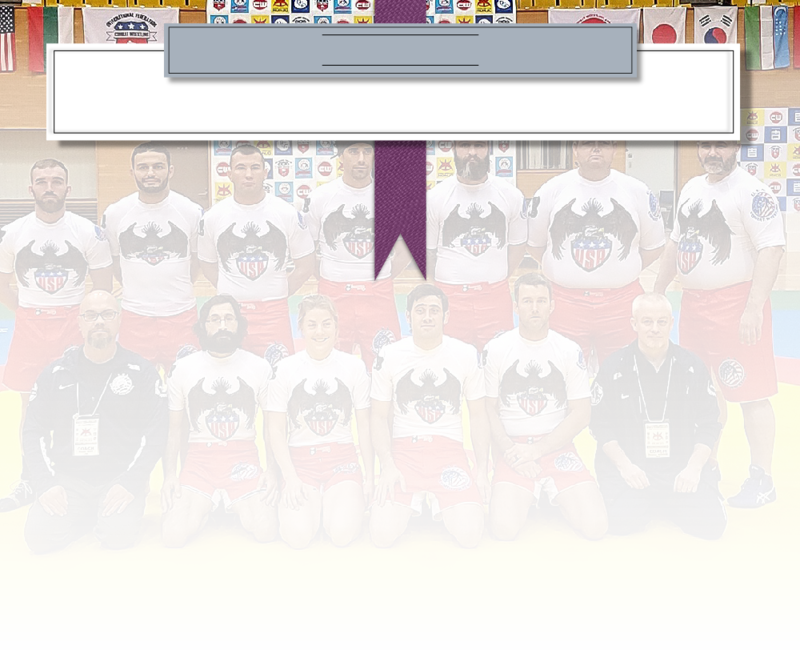 Since that time Michael has been on 10 USA Grappling World Teams and won 7 Nogi World Medals - Bronze in 2007, 2009, 2010, 2011 and 2014 and silver in 2012 and 2015. In 2013 Michael won the Unifight World Nogi Championships in Medyn, Russia; in 2016 the UWW Pan-American Nogi Gold; in 2015, the Veterans World Championship in Moscow, Russia he took home two gold medals in two different weight classes. Michael has won multiple Absolute and Advanced Divisions Championships at NAGA, Grappling Industries, and other top organizations. Nico is a 3 time USA Combat Wrestling National Champion and 3 time FICW World Champion at 90kg, having took home Gold from Hungary in 2016, Japan in 2017 and St. Louis in 2018. He has been Wrestling since the age of 12, Niko became an Oklahoma junior high school and high school state champion. During his collegiate career at Bacone College, Niko was the first All-American in the college’s history, a 3x First Team All-American wrestler and 2x national finalist. Team captain for four years, Niko was awarded “Most Valuable Wrestler,” “Wrestler of The Year,” and a “Champions of Character Award.” After completing his triple major bachelor’s degree, Niko became a Graduate Assistant Wrestling Coach at Missouri Valley College where he assisted in coaching several All-Americans and helped the Vikings finish in the top 4. Not long after finishing up his Masters in Business, he found himself training Muay Thai, boxing, Brazilian Jiu Jitsu and Catch Wrestling in preparation for an MMA career that culminated with a combined amateur and professional record of 9-0. During the past 7 years, Niko has won numerous BJJ and submission grappling tournaments at the expert or black belt level. He is currently lead wrestling and MMA Coach at Championship MMA in Fort Smith, AR. Joshua is a former Army Infantry Combat Veteran, 2x Folkstyle National champion, 12x freestyle state champion (Colorado), 6 x All-American. As a submission grappler he has 35 combined golds in Catch Wrestling, BJJ and submission only events since 2016. He is the AGF Oklahoma and Arkansas State champion, AGF National Champion, and NAGA Texas state champion. Joshua is a level-1 catch as catch can wrestling coach for Searcy Wrestling Club in Searcy, Arkansas. He trained under Jarvis Kolen and Boyd Ritchie. Matthew Paul is a 2x USACW National Champion who took home Combat Wrestling Bronze at the 2017 World Championship in Japan and 2018 Gold at the St, Louis Worlds. He is a professional fighter and jiujitsu competitor out of 10th planet Chicago. He previously held an amateur MMA ecord of 15-1 and held championship belts at 185lb and 205lb. As a professional Matthew is currently 2-2, having fought on high level shows such as Bellator and XFO. In 2018 he fought professional kickboxing for Glory, winning with a 2nd round KO. As a jiujitsu competitor he holds a purple belt under Josh Passini (10th planet brown belt under Eddie Bravo), but has competed at the black and brown belt level for some time. At Gracie Worlds he has won 205lb blue belt division in 2014, 205lb and heavyweight both gi and no gi purple belt divisions, and 2nd place heavyweight brown belt nationals, among other high level competitions. Keith has been grappling on and off since high school. he competed as a folkstyle wrestler in high school and later began training Brazillian Jiu-Jitsu in 2009. Keith has been with the same instructor since that time, having earned his purple belt from Kyle Watson (of Watson Martial Arts in St. Louis Missouri). He has competed in a number of grappling tournaments since that time, with many different rule sets, including the 2018 Combat Wrestling US Nationals, where he placed second. While traveling for work, Keith has has the opportunity to train all over the US, as well as Japan and Mexico. Keith believes that his game is very diversified due to the numerous instructors trained with. He is currently the Brazilian Jiu-Jitsu instructor at Piasa Martial Arts in Alton, Illinois; a team affiliate of Watson Martial Arts.